If you require assistance with your garage, you’ve come to the right place! Recognized for our professional garage floor coating in Roanoke, TX, we originally began our business in 2003. We wanted to craft the perfect garage, and when we could not find what we needed in the industry, we made the decision to create it ourselves. Now, we proudly provide professional garage storage solutions, along with top-of-the-line polyurea polyaspartic floor coatings, that have a significantly longer lifespan than epoxy. Our team of experts is dedicated to providing DFW with quality garage solutions and garage floor coating. 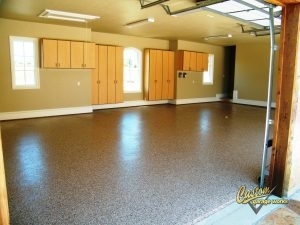 Our custom garage floor coating in Roanoke, TX is one of our most popular garage options! This is because our polyurea polyaspartic coatings create a superior finish that lasts for decades. While epoxy coatings start to peel and turn yellow within a short span of time, our polyurea based garage floor coating does not. In addition to our floor preparation, which includes professional diamond grinding, instead of acid etching, you end up with a showroom quality floor that is easy to clean, and practically indestructible. Give us a call at 214-494-9068 or 817-308-1305 for your free estimate now, and we can tell you more about our premium garage floor coating service. Garage Floor Grinding Our garage floor grinding service is the best way to properly prep your floor for a coating system. And More! 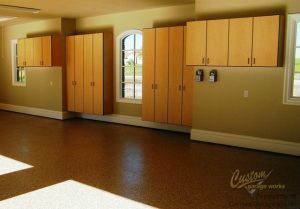 Discover more about our selection of custom floor coatings, and decide which one will work best for you! When you are running out of space in your garage, Custom Garage Works has the right garage storage and organization solution for you! The best custom garages have an organization method in place. To address the unique organizational needs of our clients, we offer a variety of different organization products, including overhead storage racks and cabinets. All of our Bulldog cabinets are secured to the wall for added safety, and our overhead storage racks are stronger and more dependable than the others you’ll find on the market. We are committed to helping our clients get the perfect garage floor coating and organization for their requirements and budget, and we look forward to serving you! Overhead Storage Racks When you want to get more out of your overhead storage space, our durable storage racks are a fantastic place to start! And More! We offer a wide selection of garage organization resolutions to our clients, to provide the ultimate custom garage!